The images for the Android 8.1 developer preview may have gone live yesterday, but it took a full day for the OTA update to start rolling out. 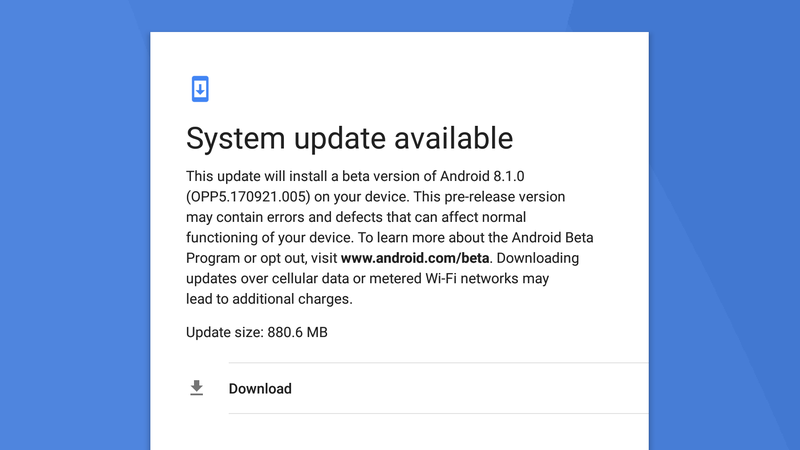 If you signed up for the Android Beta Program on a compatible device, you should see the 8.1 developer preview update hit your device soon. 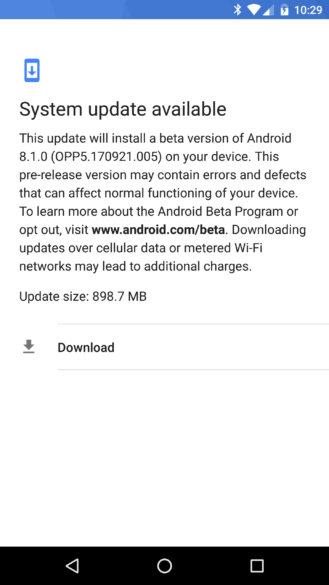 On that note, Google also seems to have pulled the manual OTA file downloads for the 8.1 developer preview, so right now your only options for migrating to the developer preview are registering for the Android Beta Program and waiting for the update, or flashing from the full factory images onto an unlocked bootloader. That means right now only those on an unlocked bootloader can manually upgrade to the 8.1 developer preview images. Although it is possible to sideload an OTA image file onto a locked device, Google is currently redirecting the developer preview OTA downloads page to the developer preview factory images page. We heard there were a few complaints, and it appears that Google decided to pull the images in the meantime. The full factory images shouldn't be affected by the verification problem some saw with the OTAs. Android 8.1 OTA's are live now. If you have enrolled for the Android Beta program, please expect them shortly. At this point in time, we do not have OTA images that can be side loaded. So, if you're on a bootloader-locked device, right now your only options for moving to the 8.1 developer previews are to register for the beta program or wait for Google to bring back the OTA files for sideloading. At least now the Beta Program OTA appears to be rolling out, so you shouldn't have to wait too long if that's the route you take. In addition to the reports we've received, we can confirm that an OTA from the Beta Program registration has hit one of our devices.